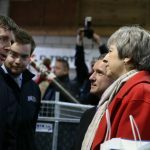 Prime Minister seeks views of trailer firm boss about Brexit | News by Wales Express News, People Before Profit! The boss of Europe’s biggest trailer maker has personally urged the Prime Minister to provide certainty for businesses over Brexit. 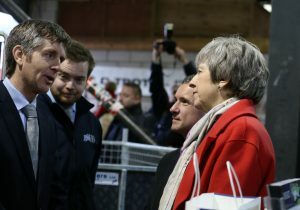 Theresa May is touring the UK to sell her EU withdrawal agreement and, whilst visiting the Royal Welsh Winter Fair in Builth Wells, she met with John Williams, Managing Director of Ifor Williams Trailers. John Williams, the managing director of Ifor Williams Trailers, with Prime Minister Theresa May and Welsh Secretary Alun Cairns. The meeting had been arranged by officials from 10 Downing Street because the Prime Minister particularly wanted to hear the views of a major exporter like Ifor Williams Trailers and discuss the impact of Brexit on international businesses. Mrs May and the Welsh Secretary Alun Cairns listened carefully to Mr Williams’ concerns about the need for frictionless trade with Europe. Among the products Mrs May saw on the company’s stand was the newly-launched HBX horsebox that is attracting worldwide interest after it was unveiled at their 60th anniversary celebrations. Mr Williams said: “Mrs May had been comprehensively briefed by Alun Cairns. He described our brand and products as iconic and stressed the economic importance of Ifor Williams Trailers, within both Wales and the UK. “Her immediate interest was in the how the business was faring and I explained that business was positive and that we had just launched our brand new HBX horsebox to coincide with our 60th anniversary. “We exchanged views on the importance of completing the deal on Brexit and getting some certainty back into the trading environment. “She listened carefully to what I had to say and offered a full understanding of the ongoing need for a frictionless trade relationship with our respected European neighbours. “We’ve worked very hard for the last 20 years developing our European market and sales overseas. “Mrs May understood export is a large part of our turnover and this was one of the reasons why she had made a point of meeting us.